You want to maintain a great looking lawn year round, but that can prove to be difficult if you are having problems with your home’s lawn irrigation. The time of relying upon old rotating sprinklers and garden hoses for your home irrigation is gone, and now with automatic sprinkler systems maintaining your lawn is easier than ever. However, that doesn’t mean that there isn’t often some amount of work that will be involved in the process. If you’ve begun to notice problems with your watering after installing an automatic system, or the results are not what you have seen in the past, then you might be in need of the assistance of professional service. When faced with these kinds of problems, you will want to make certain you turn to a professional lawn sprinkler company for assistance. This can often be resolved with a relatively simple solution. The first thing you will want to do is check your sprinkler’s timer box and adjust the settings. If something has been turned off or the timers are incorrectly set, it may be the reason that no watering has occurred. If your timer box is properly set this can be a number of other problems as well. One common issue is clogged filters which will block water flow and prevent your sprinklers from functioning properly. A home sprinkler care professional will be able to quickly and easily resolve this with some general maintenance. There’s many ways that this kind of problem can occur, but the issue most commonly comes about due to damage from landscaping or improperly parked vehicles. Your sprinkler heads can be fragile, and if someone has driven over one, or they’ve suffered damage from a mower or trimmer, you can end up having troublesome leaks that flood your lawn and cause significant amounts of runoff. Another cause to this problem is having loose connections, which is easily resolved without the assistance of lawn care professional. If your sprinkler heads do not appear damaged and you are suffering a leak, try to tighten the head if it feels loose; doing so will most likely resolve the problem. If the sprinkler head is not loose or damaged the problem most likely originates in the pipes themselves. This kind of repair is best left to professionals and in a case su ch as this you definitely want to contact the expert team at JWR Sprinklers right away to prevent a significant spike in your water bill. If water is pooling up around your sprinkler heads then you most likely have an issue with your water line. These problems can become worse over time and most commonly occur early in the spring if your system has suffered any freeze damage during the winter. To repair these lines they will have to be dug up, and the best way to have them serviced is with the help of an experienced lawn sprinkler company. Water line issues can also result in serious backflow problems. 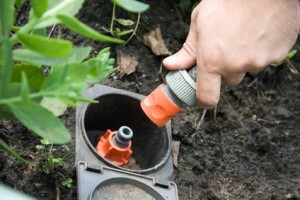 In this case you will need to get your backflow preventer repaired or replaced. Your backflow preventer helps to avoid situations that can result in contamination of your drinking water and other serious issues. If you have any of these problems with your sprinkler system you will want to see about getting it serviced right away. Failure to do so can result in mounting water costs that will most certainly begin to rapidly add up. Make certain you call on the expert team at JWR Sprinklers for any of your sprinkler repair needs. If the sprinkler head is not loose or damaged the problem most likely originates in the pipes themselves. This kind of repair is best left to professionals and in a case su ch as this you definitely want to contact the expert team at [company_name] right away to prevent a significant spike in your water bill. If you have any of these problems with your sprinkler system you will want to see about getting it serviced right away. Failure to do so can result in mounting water costs that will most certainly begin to rapidly add up. Make certain you call on the expert team at [company_name] for any of your sprinkler repair needs.